This unusual looking, yet beautiful, fruit is the mangosteen, also known as the "queen of fruit". 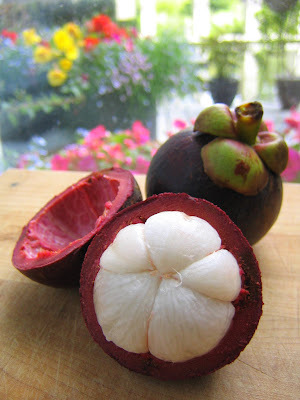 For those unfamiliar with this exotic nugget of deliciousness, the mangosteen originates from Southeast Asia and has a rich history involving its discovery and introduction to the Western world in the 18th and 19th centuries. With a tough deep purple rind and luscious creamy white segmented interior, the mangosteen's flavour is somewhat difficult to describe. To my tastebuds, the flavour combines strawberry with nectarine but also pineapple and perhaps even kiwifruit. You will just have to try it for yourself and luckily they are currently abundant. We saw many in Chinatown and bought some at T & T Supermarket. Although the mangosteens which I bought did travel many miles in order to end up in my kitchen, lately I have been more conscious about where my food is grown. Eating local not only benefits the environment, but also it helps support the local agricultural economy. I have been gorging on red Okanagan cherries from the Riley Park Farmer's Market and am eagerly awaiting the start of blueberry season. Nothing beats a big bowl of fresh blueberries topped with vanilla yogurt! Monday is my very last day at the Pan Pacific and I am happy to finally cease being a student. Thankfully, I will be returning to Ganache Pâtisserie as a part-time employee which is ideal for me because my other part-time job these days is still helping my mom rehabilitate after her leg injury. It has been a long journey in search of professional happiness and I finally feel that, despite the enormous toll on my spirit and confidence taken during my departure from Ophthalmology, the outcome is positive, hopeful, and in sight. Posted by Charmaine at 3:14 p.m.
July 10, 2007 at 6:30 a.m.